Today is the end of the month, a chance to reflect how January went. I also turn 32 today, an age I once thought was ‘old’ but now that I’m here I still feel like I am in my 20s. I suppose I’ll always feel that way. Anywho, January was pretty awesome in terms of my goals. I not only hit my goal of walking 100 miles this month, I kept it going and officially hit my second milestone, 120 miles. Finishing this goal proves to me that I can do it. I can complete things I set out to do and keep going. I’m the person that never put time into dedicating myself to going to the gym. This month, I went to the gym 30 times (31 when I count going this afternoon). While the scale has not budged, I have seen a substantial difference in the way my clothes fit. 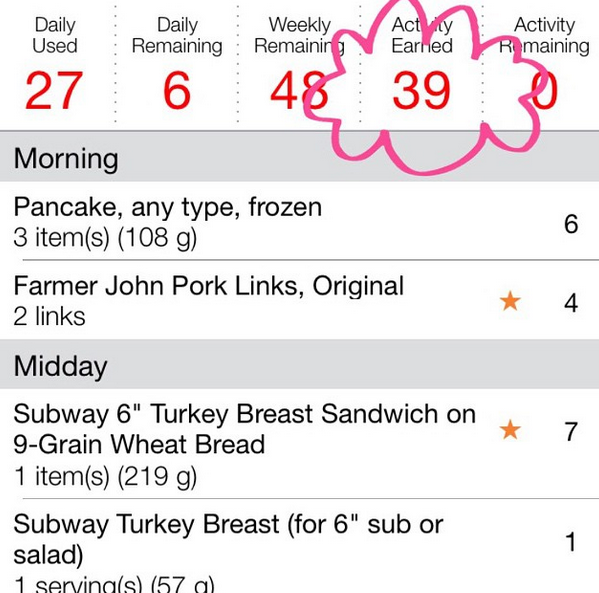 I tracked every day on Weight Watchers and earned 137 activity points. There once was a time when I would earn 1 AP a WEEK if I was really making an effort. Now that my goals for January are over, I realized how important they were in keeping me motivated! I have new goals for February, which I will share below. Fitness: I spent a lot of time on the treadmill this month, so I want to switch up my fitness routine in February to accommodate a balance of cardio and strength training. 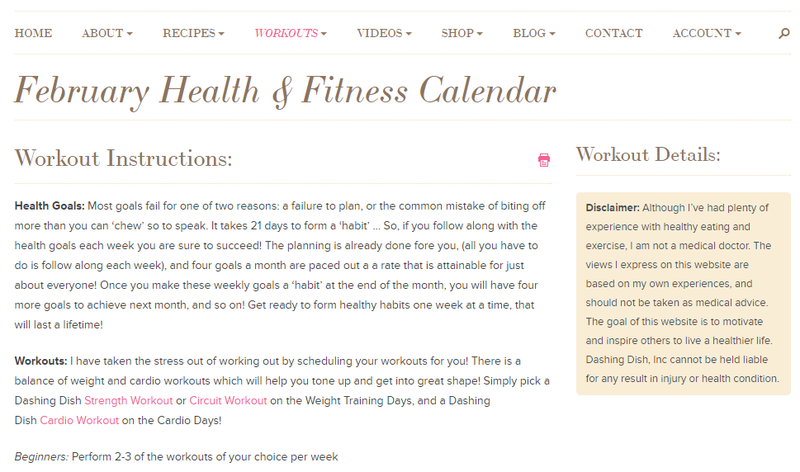 I am liking the Health and Fitness Calendar featured on Dashing Dish — Katie provides a layout of workout options for each week and then you go and grab any number of her workouts to plug in for your strength and cardio. I love her variety because there’s something for everyone, beginners to advanced. You need to become a member of her website to gain access to these monthly plans, membership is $5 a month. Along with the membership you get exclusive recipes, workout plans, guides and videos that aren’t available to non-members. While the workout calendar is a part of the membership benefits, you can still go onto her website and check out her other fitness workouts and put the month together on your own. Fashion/Beauty: Now that my walking goal is over, I decided to put February’s goal on something else I struggle with: drinking water. I know my skin and body could do well with a lot more water, so I created a challenge to drink 64 ounces of water every day. I’m going to take a ‘before’ picture of my face and see if there’s a difference by the end of the month after drinking at least 64 ounces a day. Want to join in? Find me on Instagram @bikinicountdown! Since it’s my birthday weekend/Super Bowl, there are going to be lots of (tracked!) foods I plan to indulge in — steak, eggs Benedict, nachos and pizza (don’t forget the jello shots!) are just some of the things I know I am going to be using my weeklies and activity points for this week. The rest of the week will just be about using stuff up in my pantry! Lots of things I saw this week I liked and you might be interested to check them out, too. So there’s my week — and month — wrap up, can’t wait to see how February shapes up! Don’t forget to follow me on Facebook, Twitter or Instagram so we can stay in touch. I love my Fitbit Flex — it’s helped get me more active ever since I bought it back in October. Aside from doing myself good, I can now use my Fitbit to do good for others, too. Fitbit has created a new campaign called FitForFood — the premise of the challenge is very simple: burn calories and give them to someone else. 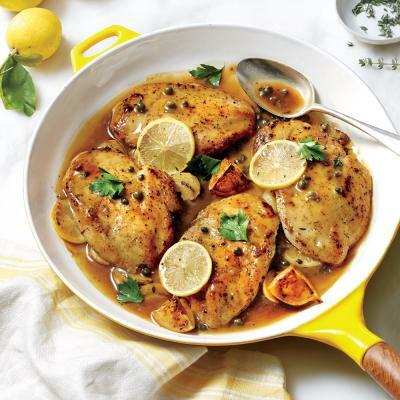 I’ve often wished I could just transfer my calories to someone else, and now it’s possible — in a unique way! Fitbit is teaming up with Feeding America in this awesome campaign — all we need to do is burn a collective 1 billion calories! Once the 1 billion calorie milestone is reached, Fitbit will give a donation to Feeding America that will help provide 1.5 million meals. 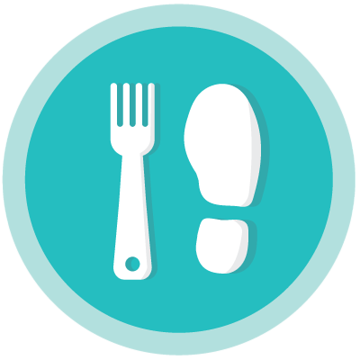 See FitForFood in action and sign up here — it officially kicks off February 3rd! 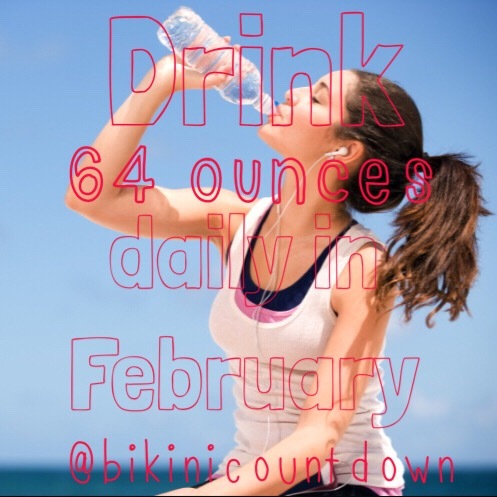 Bikini Countdown Challenge — Hydration! In general, I’ve had a hard time lately getting in my daily recommendation of water. I’ve been too dependent on grabbing a diet soda when I want a beverage, rather than water. I know that needs to change — it’s probably a good reason why the scale isn’t moving that much despite my efforts in the gym or tracking! After creating the 100 miles walking challenge in January, staying accountable through Instagram helped me tremendously — I stayed on track and will exceed the original goal by walking 120 miles in the month. This month, I’m focusing my challenge on drinking water. I’m keeping it simple and attainable for everyone by making the goal at least 64 ounces — if you can drink more, awesome! Join me February 1st in tracking water intake — tag me @bikinicountdown on Instagram and use #bikinicountdownchallenge so I can see your progress and cheer you on! Another good week doing what I need to be doing! I gained .05 this week, but I am not worried — I have been tracking everything and exercising and will just keep moving forward. I have made a good amount of progress in my #bikinicountdownchallenge and should finish it completely by tomorrow — SIX DAYS ahead of schedule. I am super proud of myself for finishing something I set out to do. There have been many days I did not feel like going to the gym, but I knew I had to get it done. For years, I’ve not felt like monitoring my portions or getting exercise — which is exactly why I’m almost 32 years old and not happy with the way I look or feel. Countless summers, milestones and deadlines for my weight loss have come and gone with no results. I’m not putting a time frame on anything this time. I am creating goals and completing them one meal, one day and one month at a time. I voiced my frustration over on Twitter about gaining a little bit this month, despite tracking and getting over 100 activity points — I feel so much better in my clothing and actually feel a bit more solid in my legs and arms, so I need to take measurements and track my progress that way. Great advice from my fellow weight watchers! 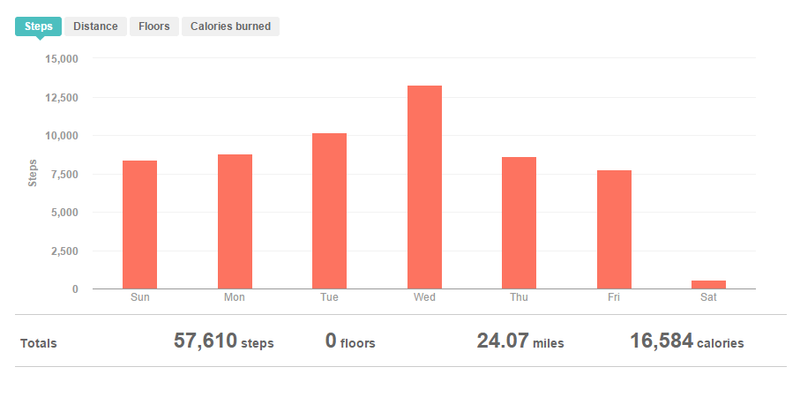 Fitness: This week has been a good one for getting in my steps. We took a trip to Disneyland, which always allows me to get in a good amount of steps. Since I am going to hit my 100 Miles in January goal tomorrow night, I am going to start the Couch to 5k training program on Monday and keep the streak going. Fashion/Beauty: Nothing much to report on this topic — I am trying to take better care of my skin and taking my Extra Strength Hair, Skin & Nails softgels from Nature’s Bounty. I have not taken them consistently enough to notice a difference, but will definitely report back once I take them as directed. While I plan on continuing my fitness goals into February, there are going to be some additional challenges I want to give myself to take better care of my skin — such as drinking water and taking vitamins. That’s my week in review, can’t wait to see where this week takes me! Don’t forget to follow me on Facebook, Twitter or Instagram so we can stay in touch. Cooking Light used a hashtag that just clicked for me at that moment and put into words the kind of way I want to eat for the rest of my life. On Weight Watchers, watching portion sizes is a huge aspect of the program — it’s something I try to keep in mind for each meal. Sometimes I’m successful and sometimes I’m not…it’s a work in progress! 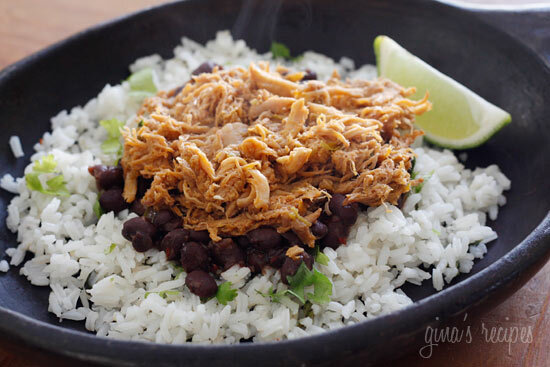 While looking for ideas during my meal planning, I often come across recipes that use many ‘healthy’ substitutes or artificial ingredients. More and more, I hear about fat-free and sugar-free products and when browsing them at the store, I see that the nutrition isn’t much better than the ‘regular’ product. While there are some things I naturally just prefer lower fat — such as skim milk — I’m 100% behind the idea of using big flavors, just eating less of it! To me, this seems like a realistic approach to learning how to navigate food for the rest of my life. When I make food at home, I want it to taste good and look appetizing — that’s the only way I’m going to be successful in watching my portions and tracking what I eat. Therefore, I must confess something to you. I choose regular bacon instead of turkey bacon. I choose an actual egg instead of egg substitute. I use regular or 2% milk cheese instead of fat-free. I cook with real butter instead of margarine. I use skim milk in my coffee instead of fat-free, non-dairy creamers. Everything in moderation! For me, #bigflavorsmallportions is a theory I know fits in my lifestyle and will keep me satisfied and on track. Luckily, with a program like Weight Watchers, I can do that. The Recipe Builder feature on eTools allows me to make adjustments as I go so I can see if an ingredient is truly worth skipping or modifying. What ingredients do you choose to swap or skip? This week was a good one in terms of staying on track with Weight Watchers and getting my daily steps in to meet my #bikinicountdownchallenge over on Instagram — I made it my goal to walk 100 miles in January and as of today, I am at 69.43 miles walked and only 30.57 to go. I’m making it a daily goal to get in at least 3.25 and every day this month I have gone a good amount over that goal so I will definitely be exceeding the 100 mile mark come January 31st. Here’s how other parts of my week went. 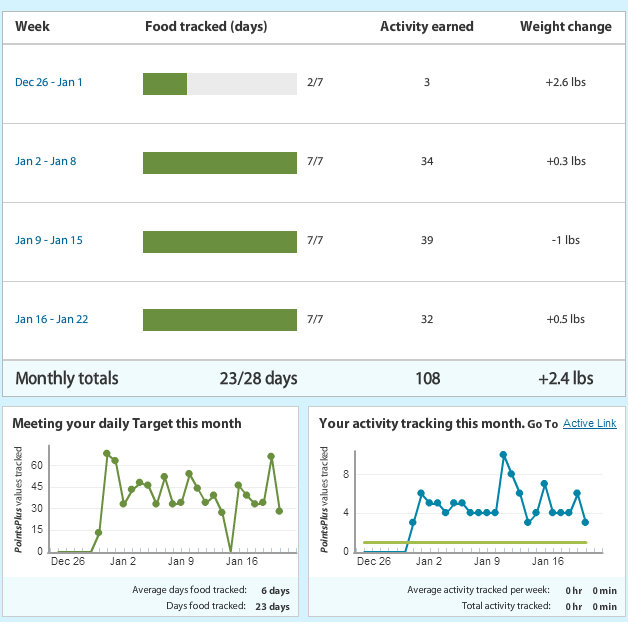 Weight Watchers: I was pretty faithful to tracking about 98% of what I ate. An improvement over the week before, but there is still one thing I am letting slide through the tracks: Frostbites. These Italian ices are super delicious and come with soft serve — I used to get a large, but now I am satisfied with a small. I haven’t had any luck figuring out how many points a small serving is, perhaps I will try to do a little better with estimating and then get to tracking 100%. I was down only a pound this weekend, but I’ve been sore and not drinking enough water so not going to worry too much. I’ve definitely been earning the activity to accommodate a small Italian ice, so I think it’s just my metabolism taking more time to rev up. Fitness: In my last review I was super proud of myself for earning 31 activity points on Weight Watchers, thanks in part to my #bikinicountdownchallenge. Well, let’s just say this week was even better! Check out how many points I earned this time around. I’ve NEVER earned that many points in a week and going to strive for 40 activity points this week. According to Fitbit this week I walked 30.41 miles thanks to a trip to Disneyland, Lana Del Rey on Spotify and a gorgeous walk around Point Vicente Lighthouse in Palos Verdes. By the way, since I spend a lot of time on my treadmill there’s only so much music I can listen to without zoning out. While zoning out is sometimes welcomed (hence the hour long Lana Del Rey sessions) I am always looking for new things to listen to and soak in so I make the most use of my time while exercising. Spotify has an amazing browse section — there’s a Word folder which has old radio shows (yes, I might have listened to an episode of Dragnet like a nerd), audiobooks, poetry and even language learning modules. I also listen to some podcasts — like today I tuned into Brandi Glanville Unfiltered for an hour and the time went by fairly quickly. Sometimes you just gotta listen to something fun that doesn’t require much thought. Fashion/Beauty: As I might have mentioned before, my amazing husband is rewarding me with an awesome birthday gift/challenge prize at the end of this month. Just in case this gorgeous Fitbit band was sold out before I had a chance to get it later in the month, I went ahead and ordered the Tory Burch for Fitbit gold band and had it gift wrapped (hey, it’s free so why not?!). I’ll open it once my birthday rolls around and I can take a pretty picture of it. I seriously love my Fitbit and I can’t wait to wear it with this beautiful piece. 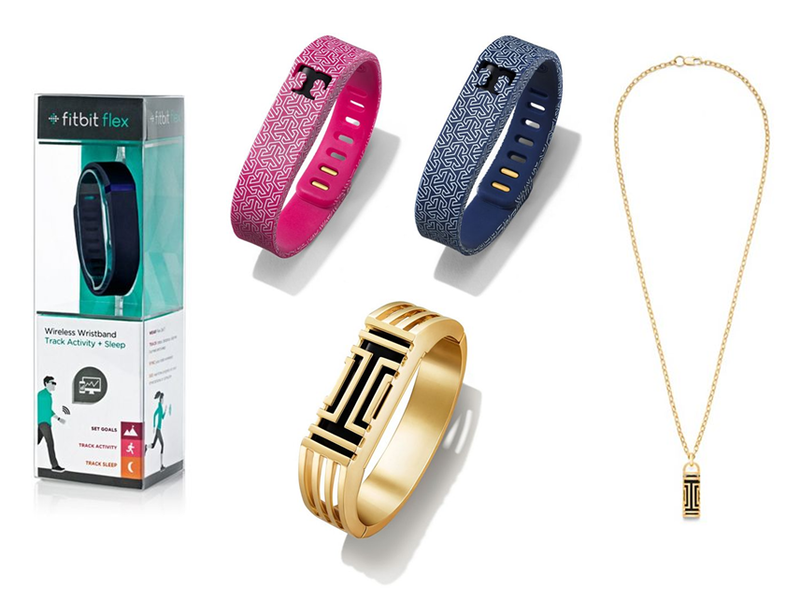 I also found some other fitness-inspired jewelry and wrote about the designs I found. Doritos Taco Salad (only 4 PP+)! That’s my week in review, can’t wait to see where this week takes me! Doesn’t sound like they work together, right? While I don’t encourage you to break out your Stella & Dot for the next trip to the gym, there are plenty of cute ways to dress up your everyday look while still holding your motivation and fitness goals close to you: fitness-inspired jewelry! 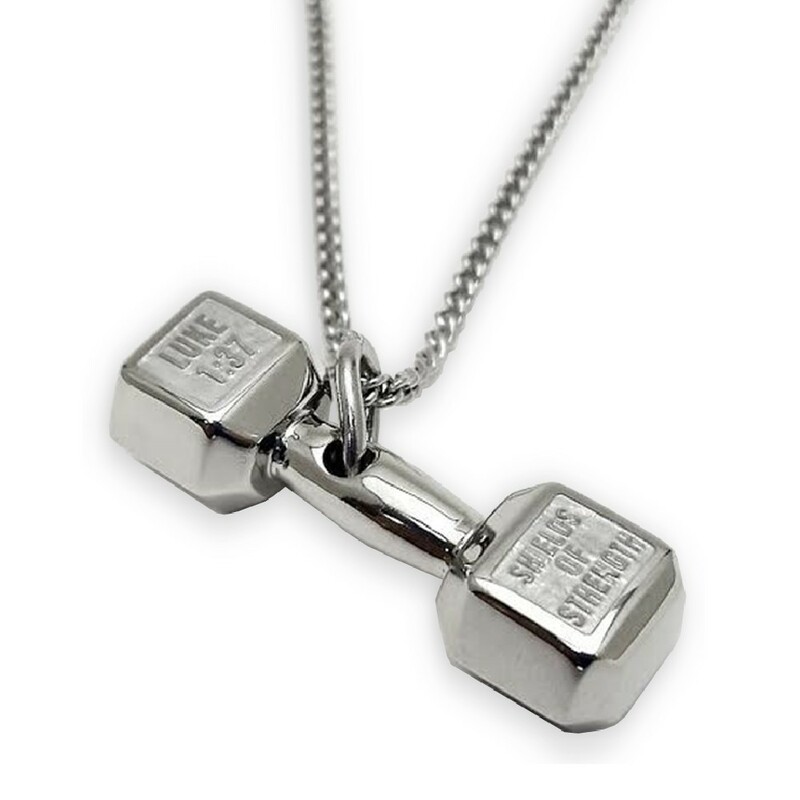 Shields of Strength: These fitness charms and jewels come with inspirational Bible quotes or passages. The fitness jewelry collection offers a vast selection of design options to accommodate any of your favorite activities, such as CrossFit, dumbells, weight plates and boxing. Fashletics: Each of these handmade pieces feature a motivational quote in addition to a charm — love the size and simplicity of these designs! When you need a constant reminder that you can do it, these charms and necklaces are perfect. Fashletics features collections for CrossFit, running and weightlifting! I think the mini kettleball charms are so adorable, aren’t they? 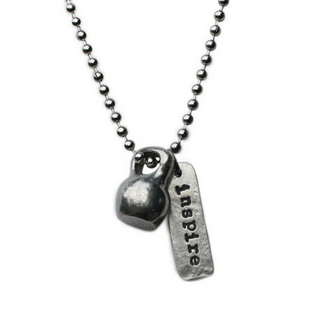 Of course, there are also charms that don’t feature any fitness equipment, simply an inspirational message. 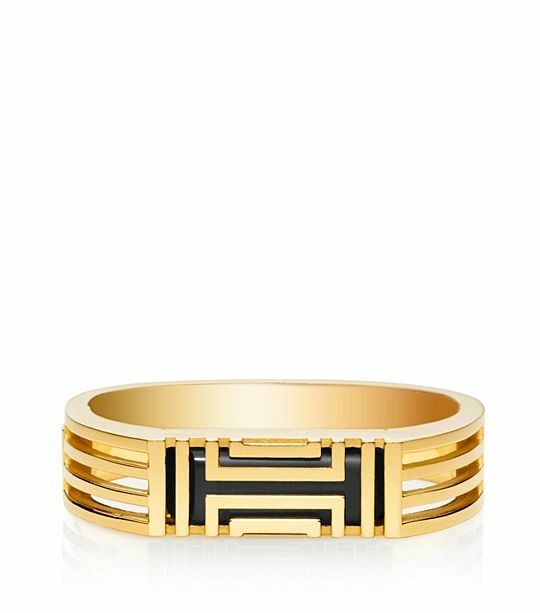 Tory Burch for Fitbit: The minute I laid eyes on this Fitbit band I knew I would love to wear it on special occasions. Since I wear my Fitbit everywhere I go, it’s not always ideal to throw on a nice outfit and wear the silicon bands. For those special events, this gorgeous gold band will be the perfect accessory for me. The Tory Burch Fitbit band is my birthday present + reward for finishing my 100 miles in January challenge over on Instagram (@bikinicountdown) — I’m only 41.12 miles away from completing it! Are there any pieces of jewelry you love to wear for extra encouragement or motivation?